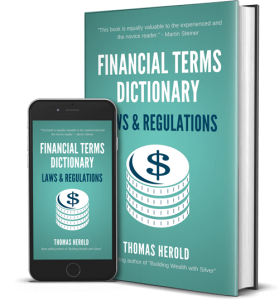 This practical financial dictionary for Laws & Regulation terms helps you understand and comprehend most common Laws & Regulation lingo. It was written with an emphasis to quickly grasp the context without using jargon. Each of the Laws & Regulation terms is explained in detail and also gives practical examples. This book is useful if you are new to business and finance. It includes most Laws & Regulation terms for businesses, investors and entrepreneurs. It also covers the lingo that was introduced in the financial crisis of 2008 until 2017. With the alphabetical order it makes it quick and easy to find what you are looking for. Example Term: What is a Defined Benefit Plan? A defined benefit plan is a pension plan that serves as a vehicle for retirement. These plans give owners who are retiring benefits that are already pre-determined when they are established. These plans turn out to be a win-win situation for all parties. Employees like the set benefit towards retirement that this provides. Employers also appreciate particular features of the plan. An employer is able to make larger contributions with this type of plan than with a defined contribution plan. Businesses can deduct the amounts they contribute from their tax liabilities. These types of plans are more complicated than the defined contribution plans. This is what sets the two types of plans apart. Defined benefit plans are more expensive to set up and to maintain than are alternative employee benefit plans. What makes these plans more helpful to employees is the contributor. Employers usually contribute the most to them. Cases exist where employees can make voluntary contributions of their own. Occasionally the plan requires employees to make contributions. Whoever contributes, the benefits delivered by the plan are limited. The IRS sets and changes these limits every few years. There are numerous distinctive features to these types of plans. An advantage to defined benefit plans is that plan participants can be allowed to take a loan against the value of the plan. Distributions before the participant reaches 62 are usually not allowed while the employee is still working for the company. The employees with the defined benefit plans are allowed to participate in other retirement plans. Businesses have certain requirements with these plans as well. Companies of all sizes can participate in one. They are able to offer other types of retirement plans as well. Participating companies need to have an actuary who is enrolled in the plan decide how much the funding levels should be. Businesses also may not decrease the plan benefits after they have set them. There are many advantages to defined benefit plans. Companies can confer significant retirement benefits on employees in a small amount of time. Employees can earn these benefits in a similarly short time frame. Even early retirement does not eliminate the ability to access these benefits. Employers appreciate that they can put more into these plans than with alternatives plans Employees love the predictable dollar benefits that the plans deliver. They also are happy to have a retirement account whose benefits do not depend on investment returns. The schedule for becoming vested in the money of this benefit account varies. It can be set up for immediate full vesting. Schedules for vesting can stretch to as long as seven years with defined benefit plans as well. Some employers use the flexibility with these accounts to provide an early retirement package. Offering special benefit packages for early retirement is achievable with defined benefit plans. There are also several downsides to these types of plans. They are the most complicated plan to administer and run. Defined benefit plans are also the most expensive kind of retirement benefit plan that a company can offer. The IRS penalizes companies that do not make their minimum contribution requirement for a year. They do this using an excise tax when the minimums are not met. Some companies may wish to make larger contributions to the plan than they need to do. They might be motivated by the larger tax breaks. If a company over contributes, than an excise tax also applies.